What's your favorite color? It's one of the first questions we ask when we are getting to know someone. At least it's a question we often ask when we're young. It helps us figure out who someone else is, and by contrast or commonality, who we are. Sometimes it's a question my 5-year-old asks me 3 to 4 times a day. Color is important and personal. We are both enchanted by it, and identify with it. For most of us color atuomatically evokes emotion. We are tickled pink when something pleases us. We feel a gray cloud wash over us when we are down. We are green with envy. We feel white hot anger, or see red when we are upset. Color inspires pride. Did you know that in the 17th century the Dutch actually cultivated white carrots to be orange in honor of William the Orange? Today people paint their faces and wear school, team or national colors to show support and unity. Blue is the feeling of misty ocean breeze and the soft petals of forget me nots. Blue is the taste of a freshly baked blueberry muffin. Blue is the sound of seals barking in the deep, blue bay. Blue is the sight of a giant whale soaring through the sky, and a little baby following behind. Blue is the smell of freshly steeped blueberry tea. Blue is the taste of a dense fog rolling into the shore and the taste of freshly fallen rain water. Blue is the sound of water splashes while the silent heron snatches a fish. Color also changes our mood. Red and yellow are supposed to increase appetite. Think about all the popular food chains that use red and yellow for their logos. The color blue gives the impression of authority and trustworthiness. Knowing this, it makes sense that police officers and doctors don blue scrubs or uniforms. Color also sends a message to others. We stop on red. We have a green thumb if we are good at growing plants. We wave a white flag when we've given up. Because of its strong emotional appeal color is an easy subject for students to write about and discuss. Usually on the first Friday of a new school year, I have my students write a group color poem. First, we discuss color meaning, why our favorite colors are favorites, and what we associate with certain colors. Then I share the poem "What is Brown?" by Mary O'Neil. It is from her beautiful poetry book Hailstones and Halibut Bones. I ask my students to close their eyes while I read so they can hear the images that stand out to them. When I finish reading, the students share with me the images from the poem that painted the best pictures in their minds. back of a turtle, back of a toad. and the good smell of the Sunday roast. Brown is bronze and a bow and a quiver. where the wind is tearing the shingles down. Brown is a freckle, Brown is a mole. Brown is the Earth when you dig a hold. Brown is the hair on many a head. Brown is chocolate and gingerbread. when wondering makes your mind grow wide. Brown is as comfortable as love. Mary O'Neil writes about almost every color you can think of in Hailstones and Halibut Bones, but I always share brown. There are a couple of reasons why. One, most students don't graviate towards brown when picking their color to write about. Two, I love how gorgeous her interpretation of the color is in her poem. Thinking of brown being, "as comfortable as love" and "the feeling you get inside when wondering makes your mind grow wide" is a new perspective, at least to me, on the color. It would be easy to only think of the color brown as things that are actually brown, but a poem where brown is only dirt, mud, and the color of wood would probably be pretty boring, and wouldn't really do the color justice. This is what I love about writing and poetry. This is where the catalyst for the color poems really takes flight. I tell students that one of my favorite things about poetry is the opportunity to look at the world in a new way. 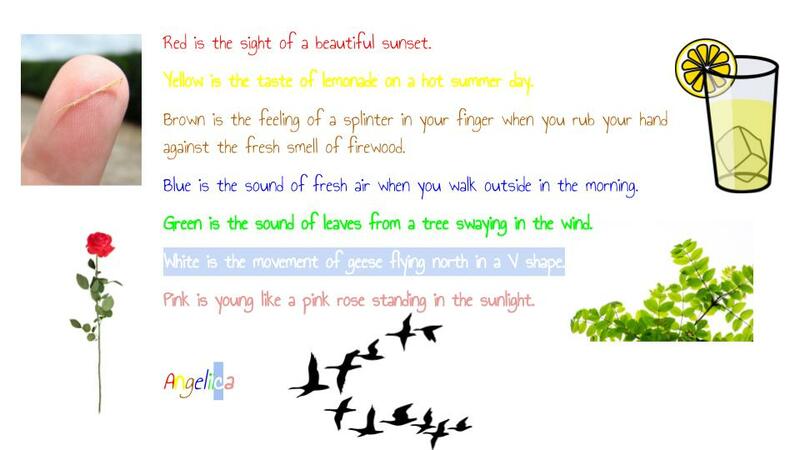 Writing color poems gives students a chance to look at colors in a new way. The students will give their colors the five senses: a taste, a sound, a sight, a feeling, and a smell. They can also give their colors movement. If the color yellow moved how would it move? Would it be a flurry of canary feathers? A spark of lightning zipping across the sky? The notes of a lullaby wafting down on a sleeping baby? The fun thing is, there is no real answer. You can't tell someone that yellow doesn't sound like the thud of your toe being stubbed. Everyone interprets, and is allowed to see, yellow in her own way. I've done the group color poems in several different ways. First, I divide the students into groups of two or three. You can divide students any way you want. At the beginning of the year, I usually pull sticks. Then I have the students pick their color. It doesn't matter if more than one group chooses the same color because the ideas will always be unique. I pass out colored markers and big pieces of butcher block paper and have the students start brainstorming and writing. 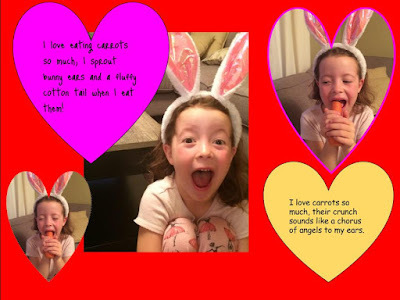 If you just want to have them do an easy Friday activity, then have them write the poems and present them in a group at the end of the period. I like for the students to draw a simple picture next to each line, and if we have extra time, make up a movement to perform with each image. If green flies like a parrot through the Amazon Rainforest then the students can start flapping their "wings". It gets them moving and laughing, especially if I act out a couple of silly lines of my own first. 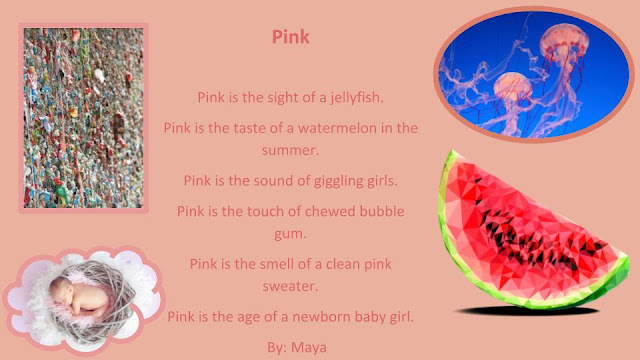 If you want to extend the activity, have your students create a poster of their color poem with carefully drawn illustrations and writing. Or if you want to add a tech element, have the class create a Google Slide Show with all of the poems on separate slides. Then the class can come up and present their poem as you move through the slide show. 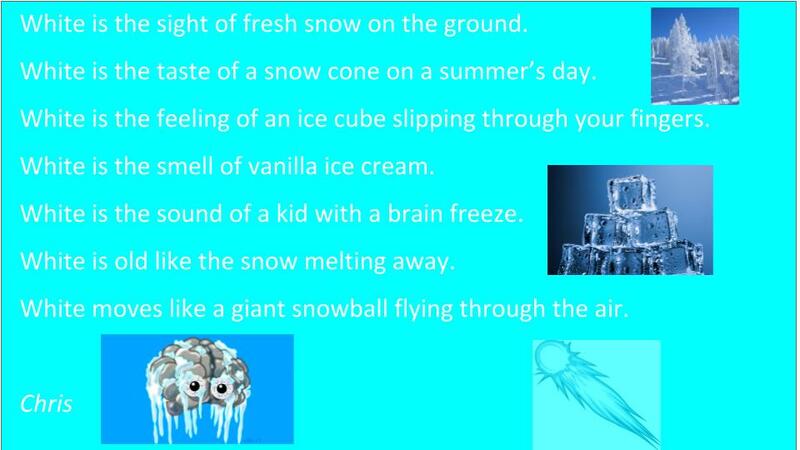 If you add the slide show to Seesaw the students could add an audio recording of their poem. Whatever your favorite color is, you probably have an opinion on how that color makes you feel, and images that come to mind whenever you think of it. 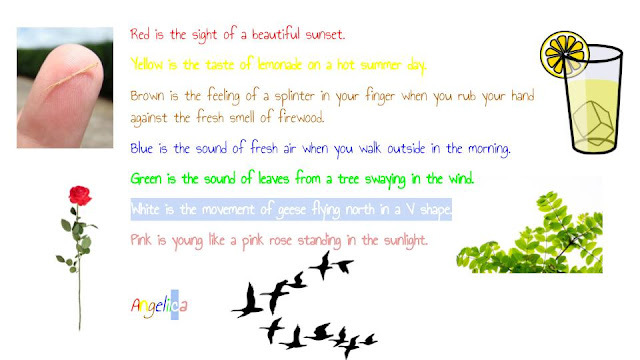 If you are looking for a fun, collaborative, and interactive poem to try during your first week back at school, or any time for that matter, give a color poem a shot. It might make you and your students see color in a completely new light. Rats, the Perfect Classroom Pet?